Having a sound system on the go can be incredibly convenient. There are numerous functions and situations where a stable audio entertainment system is simply unwieldy or inappropriate. Outdoor settings are first and foremost on this list. Still, modern technology can place a great number of demands on a single product, and few of those products can meet every demand satisfactorily. That leads us to a situation where different portable sound systems are going to be better for different situations, but figuring out which is which can be difficult. That is why we have put together a list of the 10 best portable sound systems available, each appropriate for a different use or setting. 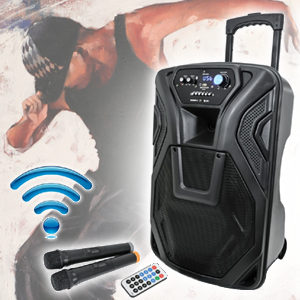 Then we provide a helpful buyer’s guide, so you can find the best portable sound system for your needs. While ION Audio may have gotten its start by converting older and obsolete forms of media like vinyl, cassette, and VHS to a digital format, that has not prevented the company from using their developments of conversion to bear on other audio markets that often rely on outdated technology. One such market is the PA system which generally favors an analog system to produce the best results. As a sharp divergence from that premise, the Tailgater seeks to provide a solid PS system for an exceptionally reasonable price. This requires balancing the different demands so that is can appeal to broad demographic. That is why the 25 RMS watts is so nice. This power level is just right for a wide variety of applications – though it is not appropriate for professional musicians. As the name implies, the Tailgater is intended to be taken on the road and used in various situations for extended periods of time. To that end ION Audio put their robust battery which can provide up to 50 hours of total playing. Though, while the upper limit of the battery’s life is impressive, you should be aware that the battery does have a tendency to degrade fairly quickly even with moderate to light use. The speaker comes with a woofer and a tweeter that feature a decent, though not great, frequency range of 77 Hz to 22 kHz. 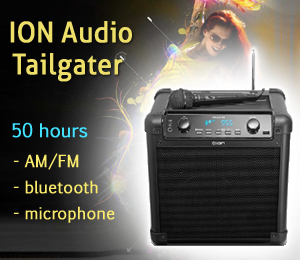 This allows the Tailgater to play various types of music hitting most of the registers used. That being said, the Tailgater’s sound quality does not hold true when turning the volume up and will suffer from significant distortion. ECOXGEAR is actually a smaller company owned by Grace Digital Inc. which was founded in 2007 on the premise of making HD radios. Since that time, the parent company has expanded to include a variety of niche speaker and audio products, of which the ECOXGEAR is a part. The ECOXGEAR brand itself is focused on the outdoor element of audio equipment, often making speakers that can be used in all weather conditions. 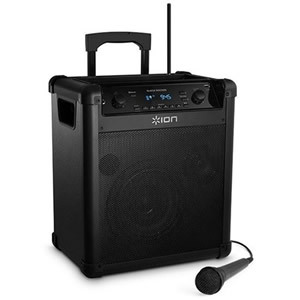 That is actually a big part of the reason we rated this portable sound system the best for schools. The IP67 water and dustproofing specifications might seem great for taking this speaker to the beach, poolside, or on an outdoors camping trip, but it also means that it can stand up to the abuse of children of all ages. Whether young children who may not be cautious or older kids who might need to borrow it for school functions, the ECOXGEAR will not break down. Another reason this speaker is ideal for a school setting is that its 50 RMS watts provide plenty of power for gymnasium or auditorium gatherings – like a pep rally or graduation service – but it will not run the risk of being too loud. 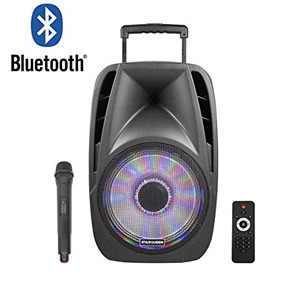 Moreover, this portable sound system features an 8” mid-range cone, an 8” passive woofer, and a 3” tweeter, so you can even hold concert recitals with it and display the full instrumental range. That being said, you definitely will have to pay a bit more for this portable sound system, but that should be expected for higher quality. Another potential concern is that the battery life is only rated for 10 hours. Granted, this should not be much of an issue for school related functions, but it does mean that a full day’s use will seriously test the ECOXGEAR’s capabilities. Starqueen is one of the few brands we reviewed that does not have a dedicated website. 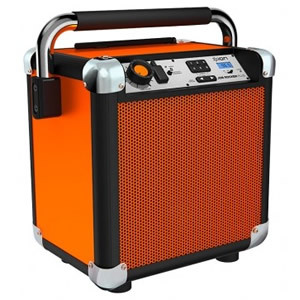 In fact, the Starqueen brand was explicitly designed to be an online only brand that sells a single product – this portable sound system – and replacement accessories for that product. Keeping that in mind, you can at least rest assured that the singular attention to this product has resulted in a surprisingly good system. While it is not exactly inexpensive, it is definitely a hair below average on the price scale, but you end up with an above average product in return. First, you can purchase this in either a 12” or 15” speaker model. While the different models will provide different power levels, even the 12” version still provides a better than average power of 30 RMS watts. However, for singers in particular, the RMS wattage is nice though not necessarily paramount. That said, the biggest advantage of this portable sound system for singers in particular is its robust mixing capabilities located on the back of the system. With the ability to add a reverb effect – necessary for quality singing – as well as a 5 channel fully customizable equalizer, this portable sound system cannot be matched in tone correction. Considering its origins, it should come as little surprise that the Hisonic is rated as our best portable sound system with a wireless mic. 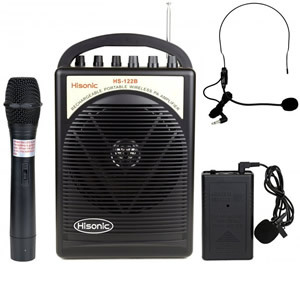 Though a somewhat recent company, Hisonic was the first to develop a PA system to use both wireless and Bluetooth connectivity with their mics. Of course, since that time, the brand has branched out into other audio equipment markets, but their commitment to wireless connectivity remains the same. 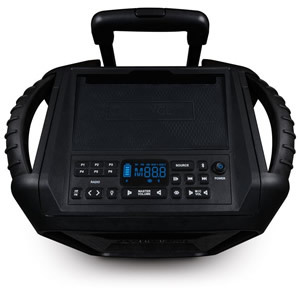 In that vein, it should also not surprise you to hear that the wireless connectivity of the Hisonic portable sound system features one of the best ranges we saw. While many brands will boast of their transmitter range, the Hisonic has been recorded at delivering clear signals up to 100 feet. Even other portable sound systems that advertise such generally fall far short of that mark. That being said, you will likely not want to rely on the mics provided by Hisonic for your speaking needs. While the transmitter might be excellent, the mic itself is not nearly as high quality. The volume will come in low, and the system does not have significant EQ settings to alleviate that issue – though it does offer reverb and two different types of microphone inputs. Behringer is actually one of the more storied companies on our list dating back to the 1960s. The company’s founder was a musical and electronics genius, constructing his first synthesizer by the age of 16. That focus on what was then cutting-edge technology continued as the current lineup of Behringer products makes it a point to provide connectivity with as many devices and pieces of hardware as possible. With that in mind, the Eurosport portable sound system – which is merely one of the audio equipment products within the Eurosport product line – is easily one of the more capable, easy to use, and effective systems for pairing your smart devices. In fact, you can even pair the Eurosport system with older devices that run on outdated Bluetooth firmware. Of course, the Eurosport does sacrifice a bit of its audio aspects in favor of this robust connectivity. For one, the Eurosport only puts out 20 watts RMS. While this is not terrible, it is definitely a bit on the low side of the spectrum. On top of that, you will definitely need to purchase a separate microphone as the one provided is poor quality. Thankfully it features two different mic ports, though they use a proprietary connection which forces you to buy Behringer brand mics. ION arguably specializes in DJ equipment, actually being a member of a larger conglomerate which also houses popular brands like Alesis, Numark, and Akai Pro. That being the case, those brands will regularly lend their designers and engineers to ION to help produce top quality equipment. The result of that union is an excellent portable sound system that manages to stay under a reasonable price point. For example, the Block Rocker produces some of the best sound quality we experienced. While it is not strictly the best portable sound system for audio quality, you will generally have to pay significantly more to get a better quality. Moreover, the engineers of the Block Rocker pairs excellent internal components with a heavy-duty, durable design that is still easily portable. Of course, being a good value does not necessarily mean “cheap,” and this is still one of the more expensive portable sound systems we reviewed. Also, while the sound quality itself is notably good, the speaker is not especially powerful only able to deliver a substandard 15 RMS watts. On top of that, the Bluetooth connection does not have great range which can make it seem a bit pointless compared to a wired connection. All too often when brands are designing sound systems, they consider large audiences or intimate gatherings. They end up focusing a great deal of the product’s features towards either the overall sound quality or the ability to produce certain types of sound – like speaking – at a high clarity while ignoring other qualities. Still, there are a number of situations where that is less of a concern. For instance, a construction jobsite is likely less worried about the quality of a speaker’s voice. Instead, this type of situation is more concerned with can the employees hear the speaker over the sound of their power tools. Well, the Job Rocker Plus does an admirable job in that respect by providing a decent 25 RMS watts of power. While this may not blow you away, it also will not disturb those outside of your jobsite either. Still, arguably the best qualities of the Job Rocker Plus are its long battery life and its integration with powering your construction equipment. For the former, the Job Rocker Plus uses the same 50-hour battery that has made the brand well-known. Still, the inclusion of two AC power outlets allows you to plug your tools, lights, or other equipment into the Job Rocker Plus while in use. Pyle is another brand we reviewed that has a long history in the audio equipment market – something which is not exceedingly common for all-in-one portable sound systems. Originally a manufacturer of woofers in the emerging audiophile market of the 1960s, Pyle sought to provide a competitively developed audio product for all applications – including automotive, marine, and outdoor settings. It is this last setting we are most interested in here as the Pyle PWMA930iBT blasts away most of the competition with an astounding 250 RMS watts. That is five times more than the next closest competitor which is not also a Pyle product. This massive amount of power is used to push an 8” subwoofer and 3” compression tweeter. Though, one of the more surprising aspects of this arrangement is how reasonably priced it is. 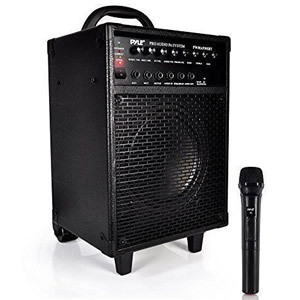 That is likely due to the fact the Pyle PWMA930iBT does not put out great sound quality – especially once you start putting those watts to the test by cranking up the volume. Keeping that in mind, this is why the Pyle is the best outdoor portable sound system for speaking and not simply the best live portable sound system. That being said, you will likely want to purchase a better quality microphone than the one that this system provides. While not as storied as some of the other brands we reviewed, Audio2000s is not a newcomer to the audio equipment scene either. While not known for innovating the industry, Audio2000s has quietly carved a niche for itself in the budget market for audio equipment. Even better, the Audio2000s brand has managed to do so without sacrificing too much quality like a number of fly-by-night brands that will pop up without a word. That being the case, this is easily the least expensive portable sound system that we reviewed, but that comes with a number of significant technological restrictions as well. For instance, the 12.5 RMS watts of this speaker is one of the lowest we saw. Combine that with the shortest battery life we encountered of 3 hours, and this can be a difficult argument to make in favor of the Audio2000s. However, the true value of this system comes in the form of movement. For one, this is easily one of the lightest and most portable system we saw at under 10 pounds. Still, you will not be tethered even by that paltry anchor as this portable system also has one of the longest wireless transmission ranges too. As Pyle has grown from a specialized woofer seller to a company which manufactures a dizzying array of products – many outside of the audio equipment market altogether – the brand still pays special attention to its roots. In that light, the Pyle PWMA860i is an amazing product coming out from Pyle’s professional lineup. This portable sound system features the most power that we reviewed at 300 RMS watts. Even better than its power rating is the fact that this system did not suffer the same levels of distortion that other powerful speakers reviewed did when turned up to high volumes. 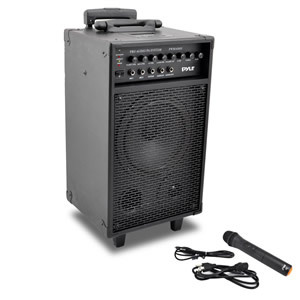 To make this product especially good for live music events, the Pyle PWMA860i provides a number of inputs including two for microphones, one for a musical instrument, and others for mixing controls. Of course, as a musically focused portable speaker system, the Pyle PWMA860i does not necessarily make use of Bluetooth or other wireless connections quite as well as some of the other products we reviewed. Another concern is that even with the wheels and telescopic handle, this system is one of the heaviest and least portable we reviewed. With all audio equipment, the power it can handle will weigh heavily. Unless you are interested in listening to your audio at a whisper, the amount of power your portable sound system can push will determine both the volume and, to an extent, audio quality of the speaker. This rating is gauged in watts, though it is important to understand that there are two wattage ratings given. Peak wattage is how many watts the system can handle in a single spike, but is not how many watts it will continuously use. RMS wattage is what tells you the continuous power rating and is the better judge of the system’s power level. Since portable sound systems are generally not used exclusively for playback features, they often need to be able to connect to other devices. 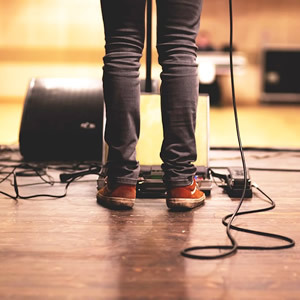 One of the more important connections a portable sound system can have is a microphone connection. 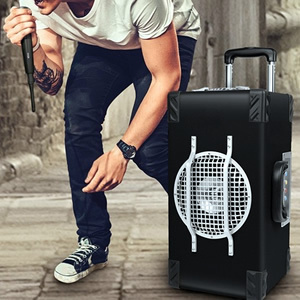 This allows you to take the speaker with you on the go for conventions or other public events. If the speaker is powerful enough, you may also want the option of plugging in a musical instrument. While guitar is the most common, many sound systems with a guitar input will accept any electronic instrument. The other connectivity consideration will focus on wireless signal transmission. This generally is accomplished one of two ways: radio or Bluetooth. Since its adoption, Bluetooth has become the more popular of the two wireless connections, but radio connection has the advantage of a longer range. This quality will tell you what type of sounds the system can accurately reproduce. Frequency is rated in hertz and will generally not go lower than 20 Hz nor higher than 20,000 Hz. This is because the human ear does not pick up sound above or below those thresholds. However, portable sound systems are not generally intended to be top of the line speakers, so you should not expect your system to play the extremes of frequency – especially for the lower bass registers. That said, a solid range will include at least 100 Hz as the lowest with 18,000 Hz as the highest. Considering the focus of our article, portability is a paramount consideration. While most sound systems will not be as heavily focused on portability, there are still a number of qualities we can use to judge this feature. One of the most important will be the system’s size. The size includes both the dimensions and the weight. The weight is fairly straight forward, but remember that lighter systems are often weaker. Dimensions become more relevant when the system is generally more than 20 pounds as the size can affect its balance and how easy it is to carry. To circumvent those issues, many manufacturers of larger, heavier sound systems will include wheels and a telescopic handle to help transport the system from one location to another. When judging this, the durability of the handle’s sleeve and the size of the wheels will generally affect its ease of transport most. 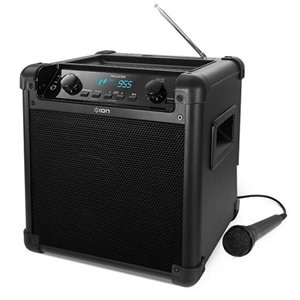 Whichever you feel is the best portable sound system will depend heavily on what you intend to use it for. If you need significant power and volume, your best bet is to go with one of the two Pyles. Keep in mind, that even though both Pyle sound systems are similar in power ratings, one is significantly better in audio quality. 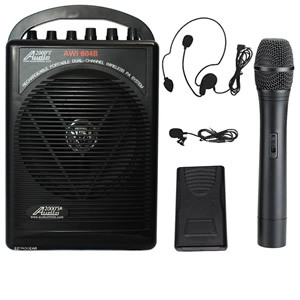 Of course, if you do not have the money to spend on a top end portable sound system, the Audio2000s provides a decent budget option if all you need to do is speak in front of a small, intimate gathering. 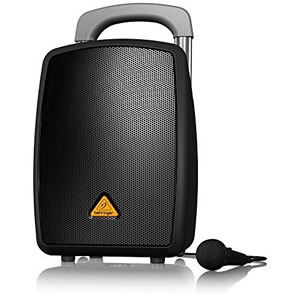 A classroom or corporate office is an excellent setting for this portable sound system. Alternatively, the Hisonic is another good option that is inexpensive and easily portable.